Get your tickets and join the QuakeCon Community for exciting Bethesda exclusive events, hands-on gameplay, edge of your seat Esports tournaments, thrilling table top games and the best LAN party in the world! Reserve your spot today, with seats starting at only $75. For complete listings and benefits of each ticket view + more details for each option during checkout. All package and ticket/badge sales are non-refundable and non-transferable, including all cancellations. For more information, visit our FAQ page on our official website. 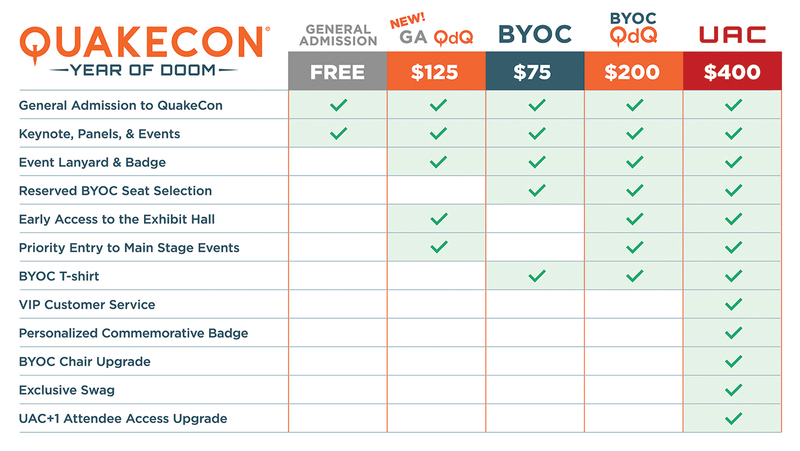 By purchasing a ticket, you acknowledge and accept terms and conditions for attending QuakeCon. Bethesda Softworks and/or Id Software, reserve the right to deny entry or remove from the QuakeCon® facilities any person who, in its sole and absolute discretion, is behaving or threatening to behave in a manner which Bethesda or id considers disruptive. Any matters not specifically covered by the preceding rules, terms and conditions, and/or regulations shall be subject solely to the decision of Bethesda Softworks and/or Id Software. Bethesda Softworks and/or Id Software shall have full power in the matter of interpretation, amendment, and enforcement of all said rules and regulations. © 2019 ZENIMAX MEDIA INC. All sales are final. Tickets are non-refundable.